Rated 5 out of 5 by Cgristiab from Great raincoat from Hunter Great webpage for easy purchases. 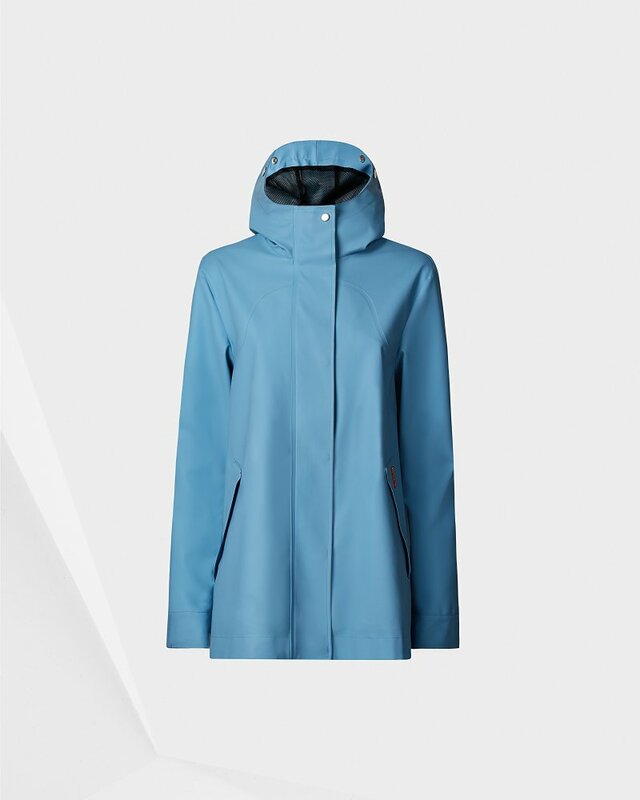 Prompt delivery and now my wife can enjoy her great raincoat when we deal with the seasons weather surprises. Good on you Hunter people as this web shop works ! Rated 1 out of 5 by Violetcream from Lovely style from Hunter However, sadly two of the poppers fell off on its first outing. Maybe I was unlucky and it was just my coat that was badly made. Not what you would expect from a coat that costs £195. Returned for a refund as I didn't want to risk it happening again. Rated 5 out of 5 by DeeDee23 from Quality garment Just bought it but by just trying it in the mirror I'm smitten.... Can't wait for the rain! Rated 2 out of 5 by Victoria from I loved this coat, but, honestly, you'd need to be an orang utan for the sleeves to be the right length. I'm a size 8 (XS) and petite but with not particularly short arms. I'd expect a size XS to be proportioned for a smaller person. The sleeves even look too long on the model (who's probably around 5' 11'). No hope for Mrs Average. Sadly I fear all Hunter outerwear will pose this problem so it puts me off re-ordering. Rated 5 out of 5 by Deborah from I have rated the coat 5 stars even though I have had to return it for a smaller size. I love how it looks, and the quality is great but it was enormous. I'm hoping the smaller size will be a perfect fit.